Seven and Nine’s Sunday night current affairs shows – Sunday Night and 60 Minutes – have never shown too much love for one another, however, the feud has once again erupted publicly with allegations of pinching the other’s ideas. 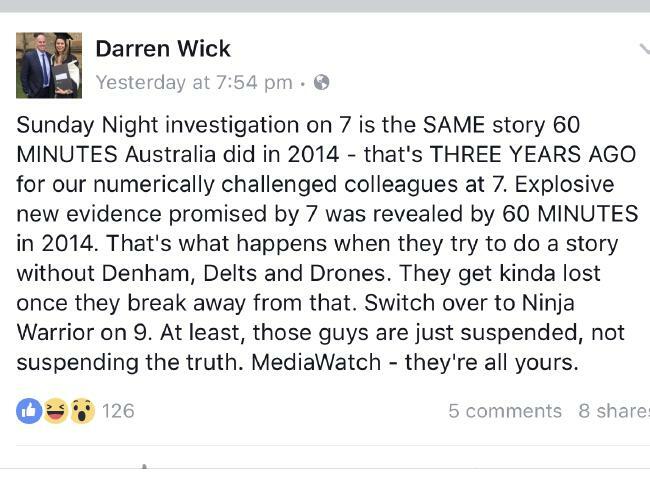 Nine’s news boss Darren Wick has accused his rivals at Seven and Sunday Night of stealing a segment that 60 Minutes aired back in 2014. In a stinging rebuke on Facebook, Wicks wrote about a Sunday Night story over the weekend about Tasmanian grandmother Sue Neill-Fraser who is in prison for killing her partner. Both Sunday Night and 60 Minutes often trade blows in the rating wars, the winner usually the one with the bigger story on the night. Also, a lot of Sunday Night staffers are ex-Nine journos. 60 Minutes is currently having the better of things, although it’s more likely the halo effect from Nine’s smash Australian Ninja Warrior. It’s not the first time Wicks has used Facebook to sledge his opposition. During the recent fight over the story for Cassie Sainsbury who is in prison in Columbia on cocaine charges, Wicks took to Facebook to claim 60 Minutes had the scoop. Commenting on his Facebook posts, Wicks told Sydney’s The Daily Telegraph his posts were borne of passion for the show and 60 Minute’s journalists.